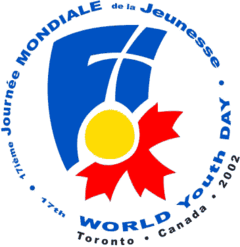 The 17th World Youth Day 2002 (WYD2002) was a Catholic youth festival held July 23-July 28, 2002, in Toronto, Canada. World Youth Day is a celebration of faith begun by Pope John Paul II held on an international level every two to three years, and WYD2002 was the 10th such event. It was also Pope John Paul II's last World Youth day. An estimated 400,000-500,000 youths from all over the world participated in the week-long festival. Although WYD is designed for Catholics, it attracts sizable numbers of youths from other faiths and denominations and was presented as a multi-faith celebration of young people from all over the world. As the event is ultimately an expression of faith, and a critical expression of faith is through service to others, World Youth Day 2002 had the support of some 25,000 volunteers; and some 100,000 pilgrims themselves spent three hours each on one of 750 service projects. The theme of the event was "You are the salt of the earth ... you are the light of the world" (Matthew 5:13-14). The groundswell of Catholic spirituality following World Youth Day 2002 in Canada led to the establishment of Canada's first national Catholic television network, Salt + Light Television. Fr. 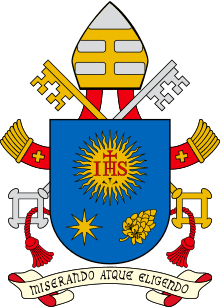 Thomas Rosica, who was the National Director of WYD2002, is also the founder and Chief Executive Officer of this new television station. World Youth Day 2002 solidified Days of the Diocese, held in various dioceses - with the majority in Montreal, Quebec and London, Ontario - as a major component leading up to the actual WYD Celebrations. The scale is massive: Days of the Diocese involved the participation of 35 of Canada's 72 dioceses. Events in various communities welcomed pilgrims from all over the world with music, prayers, and cathechetical sessions. The week-long World Youth Day Celebrations involved the use of some 129 Catholic churches and 7 halls at Exhibition Place, 10 stages (as well as Downsview Park and 5 other parks in Toronto), 30 seminars, 10 prayer experiences, 300 vocational or service group exhibits, 10 cultural gatherings. With deteriorating health, there was speculation that the Pope would not be able to attend the celebrations. At his arrival address, he thanked the local, provincial, and federal levels of the Canadian government for supporting the idea of hosting WYD. He recalled his previous Apostolic Journeys to the country and acknowledged that he does not have the same physical strength he once had. 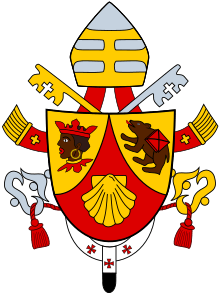 Pope John Paul II participated by being present at all the major events of the week. While not being able to participate in person, he did view the Friday Stations of the Cross via television coverage by the CBC. He led the Saturday evening vigil and presided over the Holy Mass on the Sunday, delivering a homily which focused on entrusting the future of the Church to the youth. A crowd of over 850,000 was in attendance for these events. "Lumière du monde" (International) - with an English/French chorus, and four verses in French, English, Spanish and Italian, respectively. The songs were released on a two disc official CD set entitled "Lumière du Monde/Light of the World", released by Oregon Catholic Press (OCP). The album featured bands such as Critical Mass, Susan HooKong Taylor, Janelle, and Jesse Manibusan, among others. "Light of the World" (粤話版) - with Cantonese verses and an English/Cantonese chorus translated by the "World Youth Day 2002 Theme Song Cantonese Translation Team" and sung by Tony Leung and Agnes Tao. "Light of the World" (國話版) - with Mandarin translations by Kevin Cheung; sung by Ricky Cheung and Martina Lee.